There’s a kid inside every one of us who dreams about eating candy for dinner. Now, you can satisfy that inner child’s delight with this fun recipe from See’s Candies that makes for a perfect side dish for Halloween or Thanksgiving feasts. “See’s Scotch Kiss Sweet Potatoes” sounds like it would be entirely too achingly sweet for adult palates. But surprisingly, it’s not. It’s made with See’s Scotch Kisses — marshmallows sweetened with buckwheat honey for an almost molasses-like flavor that are then hand-dipped in thick, creamy caramel. Yams or sweet potatoes get roasted in their jackets, then peeled and mashed with butter, salt and orange zest. Next, take 12 See’s Scotch Kisses, unwrap them and scatter them on top of the casserole. 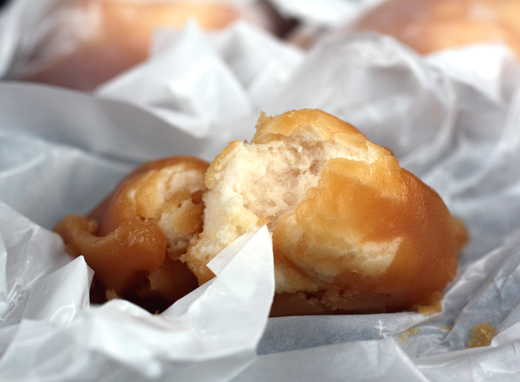 Bake until the top is golden, gooey and melty. 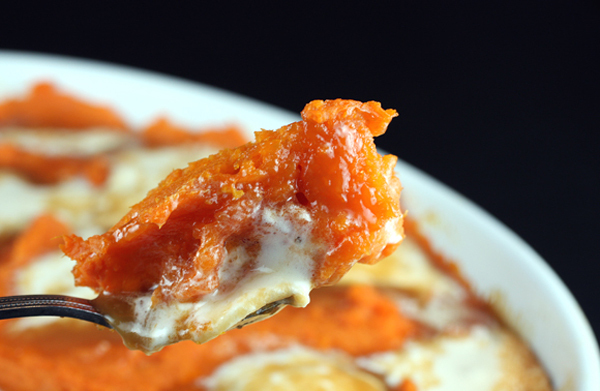 If you like melted marshmallows atop your sweet potatoes, you’ll like this even more. The dish is sweet, but not overly so. The orange zest really makes it, giving it a burst of citrus brightness. And the honey and caramel from the candies give it all a lot more interest, creating a dish that tastes like you spent far more time making it than you actually did. A splash of rum, bourbon or Grand Marinier also would be great additions. Or even a little freshly grated ginger. 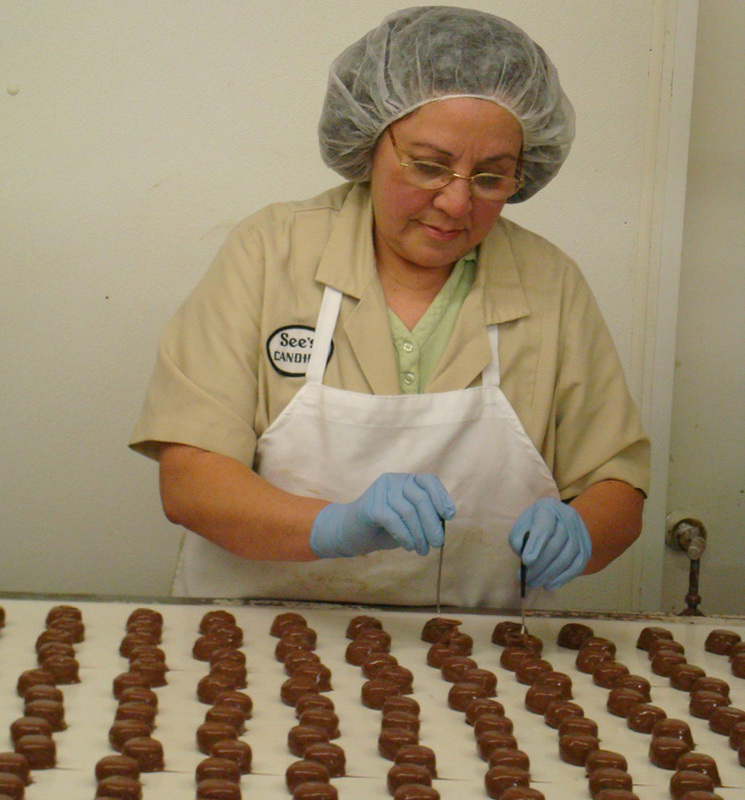 Scotch Kisses are available at See’s stores ($16.10 per pound, and you can buy as few or as many pieces as you wish) or by shopping under “Custom Mix” at Sees.com, where you’ll find it as item #19 at $19.60 per pound. Imagine the smiles at the table when you tell everyone that dinner tonight includes a whole lot of candy. Bake whole sweet potatoes in 350-degree oven until tender, approximately 40 minutes (or longer if the sweet potatoes are especially large). When done, peel and put potatoes in a bowl, add butter and mash with electric mixer or potato masher. Add salt and orange zest. Blend well. 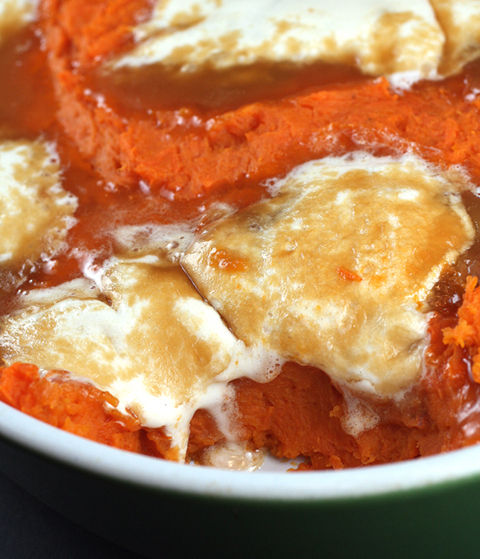 Put mashed sweet potatoes in a greased one-quart casserole. Unwrap Scotch Kisses, and scatter them on top of the casserole. Bake in oven until warm and Scotch Kisses are golden brown, about 15-20 minutes. See’s candy is killer stuff!! My best friend introduced me to it years ago! 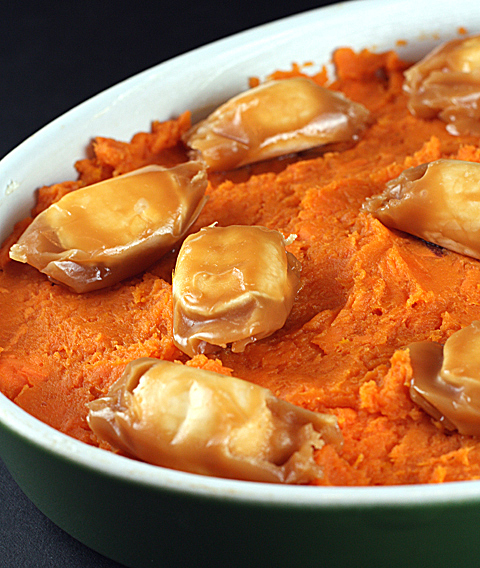 What a super idea to use those caramel-covered marshmallows on sweet potatoes! 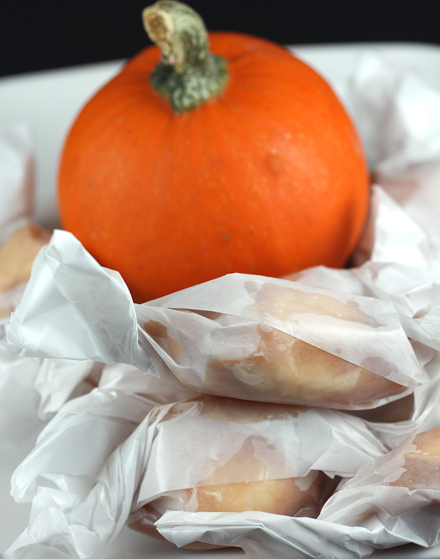 What a terrific idea to add the Scotch Kisses to sweet potatoes – scrumptious and perfect for Halloween! Oh my goodness that is awesome. My parents are native Californians, but I grew up military away from CA…my parents always were thrilled when one of my great aunts who worked in the factory that did the See’s candy packaging would send my parents a huge bag of rejects. The would hoard it like gold. Now days See’s candies are available around the country, but they still seem special to me. This is such a great idea! They look like the ultimate candied sweet potatoes…I think I might have to get some See’s! holy moly, those scotch kisses are almost my favorite thing at Sees. Wow, but could I be trusted with all those twisty bundles and would they really ever make it into the pan? What a treat! So irresistibly sweet. Wow, sounds like a brilliant idea! Love the picture with all the melting candies! That’s very creative. What an unexpected but simple sounding idea! when staying in L.A. i’m usually passing See’s going from meeting to meeting..i use LaCienega to avoid freeway traffic jams…love the use of the candies on the sweets! nice ideas for the holidays! Of course we all NEED to buy the 1 lb box! Great recipe. Will have to try this at Thanksgiving. Sorry I just realized I mispelled your name!! Whoops! What a genius idea! I cannot talk more *candies are sticking to my teeth*…obviously I ate faster than I could think of what to write. Awwww…. Wow, what a lovely dish with See’s candies…as a matter of fact we are addicted to See’s…will love to try the pumpkin with the candies…YUMMIE! Great photos! Wow that is dinner? I think that’s the most amazing dish I have ever seen. It is main course AND dessert in a mouthful! I’ve always thought that sweet potato dishes served over the holidays were more similar to desserts than main course veggies and this is definitely in that category! But in a good way! Love sweet potatoes and love Sees. They have a really good pumpkin sucker out right now. Of course,to get the Scotch thingees, you have to GO to See’s and THAT means at least one free sample and THATmight mean buying something additional and I guess from there, I should just forget about eating it all, just use a spatula to slather the stuff on my gut. Oy. Excuse me while I wipe some stuff from my eye. Okay. I can see the computer screen now. Scotch Kisses were my Grandmas favorite candy. My aunt used to buy her a bag every year for Christmas, since Grandma couldn’t find them locally. At one point my aunt started giving them to my Grandma on the side because if we knew where they were we would all sneak one and Grandma would be left with only a few of her precious candies. This will be my first Thanksgiving at my Aunts house since my Grandma passed away. I think it only appropriate, since I have been given the task of bringing the sweet potatoes, that I make this dish. I’m always amazed at how something as simple as a piece of candy can remind me of so much love. Thank you Carolyn. I’ve made this for years with a bit of change. I mash the potatoes with butter and half and half, add a little fresh squeezed orange juice, some chopped fresh pineapple, and totally cover the potatoes with the candy and add chunks of butter. A little dark rum is great too. It isn’t cheap to make but so worth it. Amber: I love your fully loaded version of this! Sounds irresistible.